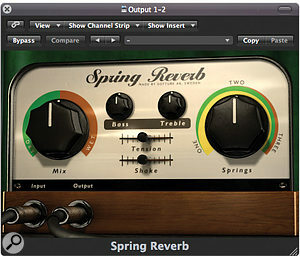 Softube's Spring Reverb aims to provide an authentic spring reverb recreation that's so real it twangs when you kick it. Well, you can't actually kick a plug‑in but there's a Shake lever that does it for you — and it can be fully automated, should you need the effect of somebody kicking a guitar combo part‑way through a song! The usual wet/dry mic control resides on the left of the plug‑in window, while a matching knob to the right smoothly varies the sound between one, two and three springs. Two smaller knobs add bass and treble tone controls, while a further lever varies the tension of the modelled springs, which in turn changes the tonal quality of the sound, and also its decay time. The circuitry around the spring is modelled on a tube topography to add a little warmth and character to the sound but, as with a real spring, there's very little for the user to adjust. 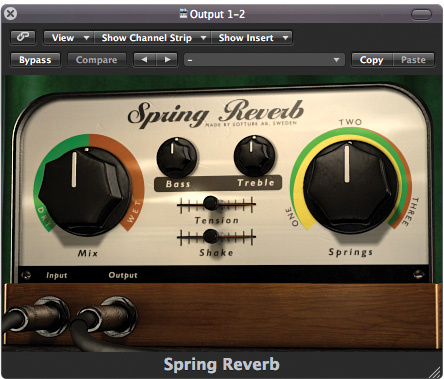 Spring Reverb is by far the most authentic‑sounding spring emulation I've heard so far. Technically speaking, spring reverbs are pretty terrible, because the reverb decay always contains an element of spring twang, and in response to picked notes or drum transients, the twangs become quite pronounced. Artistically, though, the tonal vagaries of the spring reverb work brilliantly for electric guitar (and for some types of vocal part) and this emulation sounds wonderful when used in the right context. The only non‑realistic element is the spring decay, which slides gracefully into silence rather than the hum and noise of the real thing! As you'd expect, the single‑spring emulation is the most obviously twangy, while the three‑spring variant is the smoothest. The tension control sounds most 'normal' near the centre, but the extreme settings are also very usable and, most of the time, little or no EQ is required. For recording those reverb‑heavy Peter Green‑style minor blues or just for a bit of real amp vibe added to a DI'd guitar, Spring Reverb is quite excellent. And the simulated 'kicking the amp' sound is scarily realistic! 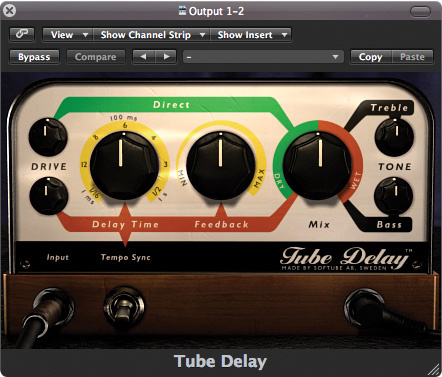 Tube Delay takes an outwardly retro approach, but there's no mention of tape: in fact, the documentation suggests tube emulation combined with a digital delay. The plug‑in offers up to 1000ms delay, with the option to sync to the host DAW's tempo. Both the dry and delayed input signal paths have their own drive controls for setting the amount of tube distortion added, and these are brought together in a large Mix knob. Treble and bass EQ, modelled on a passive circuit, are also available. Separate knobs set the delay time and feedback. In action, the plug‑in produces a very usable and musically solid sound, which can get quite tape‑like if you roll off the bottom end from the output. Oddly, though, the tone controls work on the whole signal, not just the delays, so if you want to EQ the delay only, you need to patch the plug‑in into an aux send and set it to 100 percent wet. Using the drive control in moderation dirties up the sound quite effectively, though it can get a touch gritty if you lay it on too thickly. One effect this plug‑in doesn't attempt to replicate is the slight pitch modulation many tape echo units exhibit due to worn parts or stretched tapes, but if you patch a standard chorus plug‑in directly before the delay and feed it from an aux send, you can get surprisingly close. The delay also sounds very 'real' when used in conjunction with the Spring Reverb plug‑in. $99 each: Effect Bundle including both and Acoustic Feedback plug‑in $229. Audio Ease's Speakerphone was originally reviewed in the April 2008 issue of SOS (/sos/apr08/articles/speakerphone.htm). This year has seen a major upgrade to version 2. The preset browser is now separate from the interface, and Audio Ease have added a feature that lets you use your host's automation to recall snapshots of complete configurations with one parameter. These snapshots are stored in Pro Tools presets and also in your Session file, so that you aren't overwriting globally stored presets, which would be a problem when you re-opened the Session later. Existing Speakerphone users will notice that the window has got bigger, and that Audio Ease now use pop‑up windows for tasks such as adjusting the EQ, to make the best of the space. The additional space is needed because there are now 20 more amps and cabinets, making 32 in total, each 'sampled' with four different mic positions as well as a host of different settings. Lots of other devices have also been added, including eight antique radios from the Norwegian radio collection. Audio Ease have raided Europe's largest telephone museum and sampled 25 antique telephones — the oldest being 130 years old — while the speaker section includes yet more toys, answerphones, and even an iPhone. There's also a new Liquid setting that creates that watery sound you get on a poor GSM mobile connection at the click of a button. 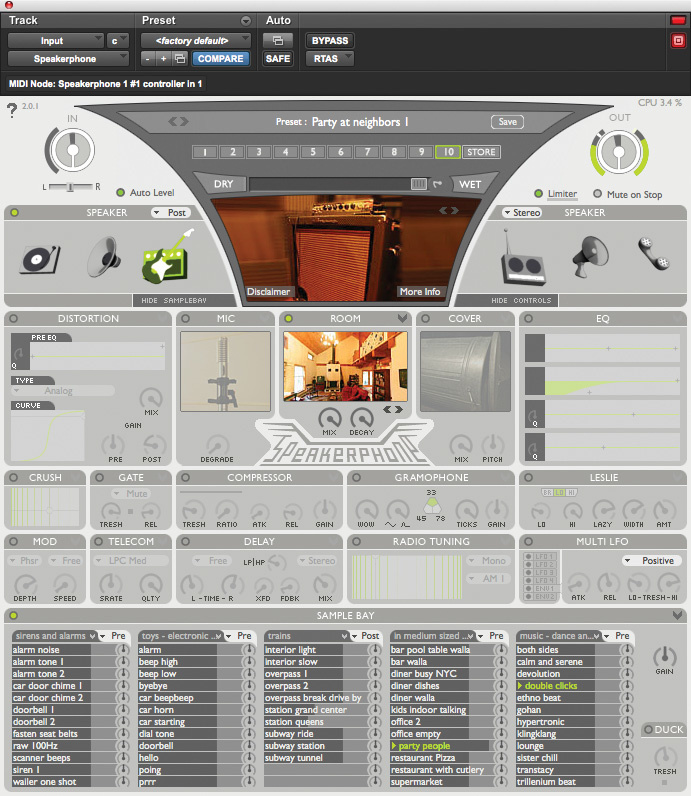 The reverb section now includes the spring reverbs from the guitar amps Audio Ease have sampled, along with more small rooms and five 'outside' impulse responses that aren't even in Altiverb yet. The sounds in the Sample Bay at the bottom can now be panned separately; it took me a while to work out how to load the library samples into the Sample Bay, but when I combined these with the new outside impulse responses, the end result was amazing. A microphone module lets you choose from one of 25 microphones, ranging from highly coloured devices to quality studio mics, while yet another new module is called Cover. This is designed to produce the effect of a sound source being covered by something such as a car‑boot lid: you can have either the listener or the sound source in the boot. This is another excellent addition, especially for post‑production users. Yet another new module is Leslie: add this to the Leslie setting in Amps & Cabinets and you get the full Leslie effect, which is stunning. Audio Ease have also added an LFO module, which you can use to vary any parameter on Speakerphone 2: 'drag' a cable to it and you will see the control move back and forth, whereupon you can adjust the depth and frequency of the LFO to get the desired variation. New too is an envelope follower so that, for example, you can get a guitar amp to distort more when the sound gets louder. £368 including VAT; upgrade from version 1, 119 Euros. 395 Euros; upgrade from version 1 119 Euros. Audio Ease +31 30 24 33 606. Ametrine Audio's main man, Robert Parry, has licensed the Wusik Station synthesizer front-end (www.wusik.com) and designed a custom sound set for it — with the sound set and bundled front-end forming the full Ravernator package. As a consequence, purchasers are supplied with two separate downloads: a smallish .exe file that contains the plug‑in, and a much larger, 800MB compressed file (which expands upon installation to 1.3GB) that contains the sound library. 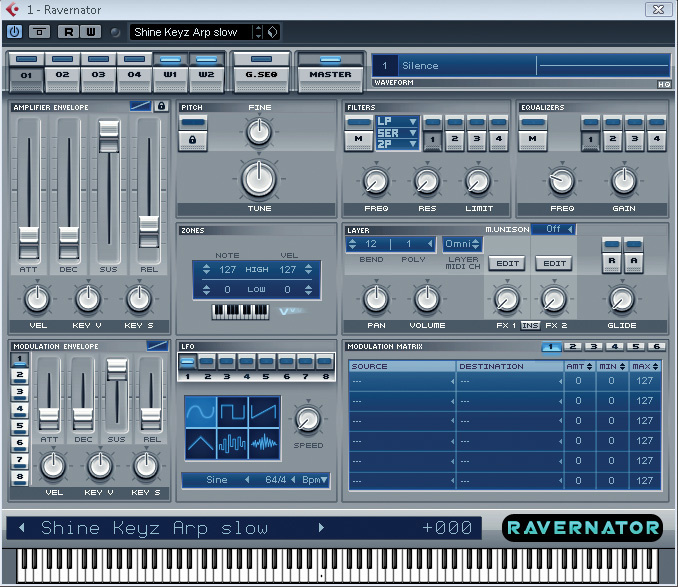 As indicated on the Ametrine Audio web site, the sounds within Ravernator have been designed with dance music producers in mind. So is Ravernator useful for spicing up your club tunes? As the sounds are dependent on the front end, a few words on Wusik Station are required. This plug‑in has been around for a number of years and has built up a steady following. 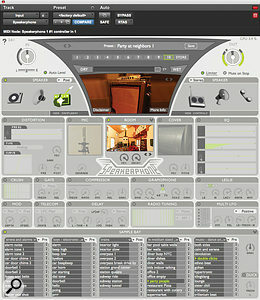 Given the relatively small footprint, it provides an impressive list of features, including six main oscillators, vector and additive synthesis, sample playback and recording, amplifier and modulation envelopes, multiple filters, including a master filter, plenty of LFO and modulation options and a range of built‑in effects that include reverbs, delays, distortion, ring modulation, compression, vocoder and talkbox. This is definitely a programmer's synth — those who tend to just load the supplied presets might find it a bit intimidating at first. However, a PDF manual is included and this provides a useful start. Ravernator's sounds are organised into six main categories: Arpeggiator presets, Chords, Kick Drums, Stabs & Rave Organs, Synths and Trance Gate. In total, over 400 main presets are provided and over 6000(!) variations built on these, combining different envelope, effects and other processing settings to create alternate versions. It's worth trying these variations, even when the basic preset might sound a little underwhelming: open up one of the more heavily tweaked versions and things suddenly spring into life. The preset categories do reinforce the fact that this is a sound set aimed at club‑based dance music. From rave to techno to trance, Ravernator has plenty to offer. 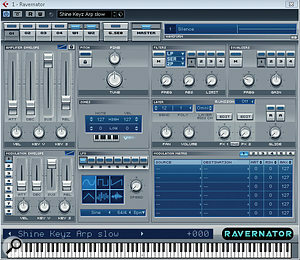 My particular favourites included the vast range of different kick-drum sounds and the arpeggiator presets. I've always been a sucker for arpeggiators, and there is a good range, from excellent through to cheesy, amongst the included sounds.